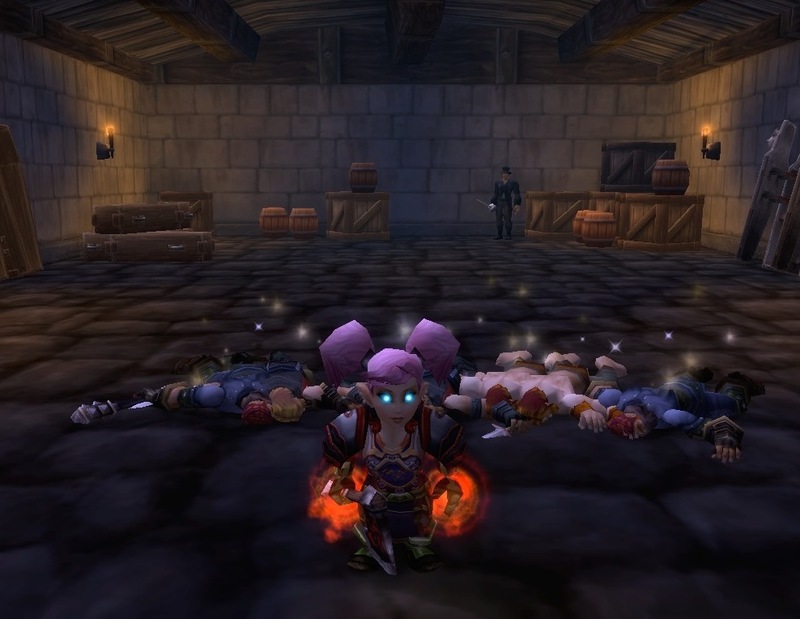 How many dungeons can my Death Knight Gnome, Riglee, solo? The “Riglee Does Dungeons” series is my attempt to find out. 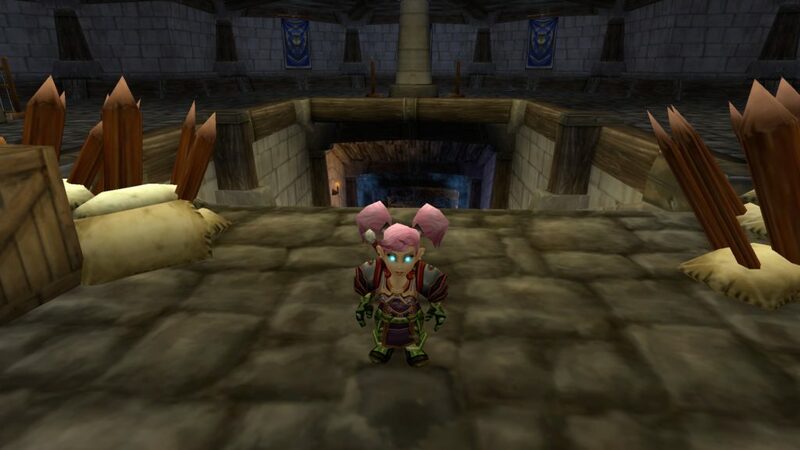 She was at Level 67 when she started this adventure. 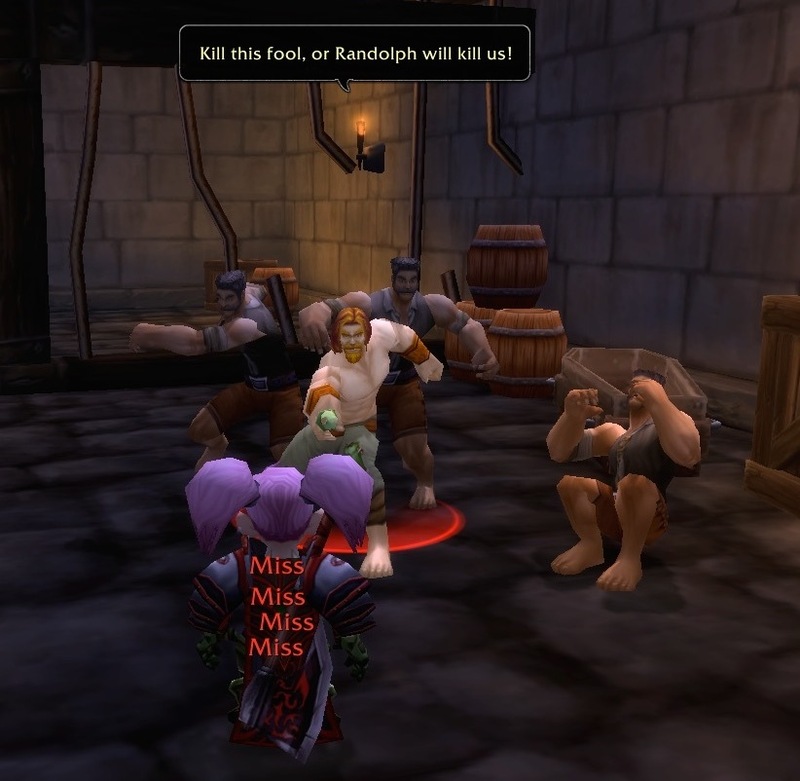 She is going to wear the Gnomeregan Tabard as she goes through each dungeon, so she can increase her reputation with Gnomeregon. 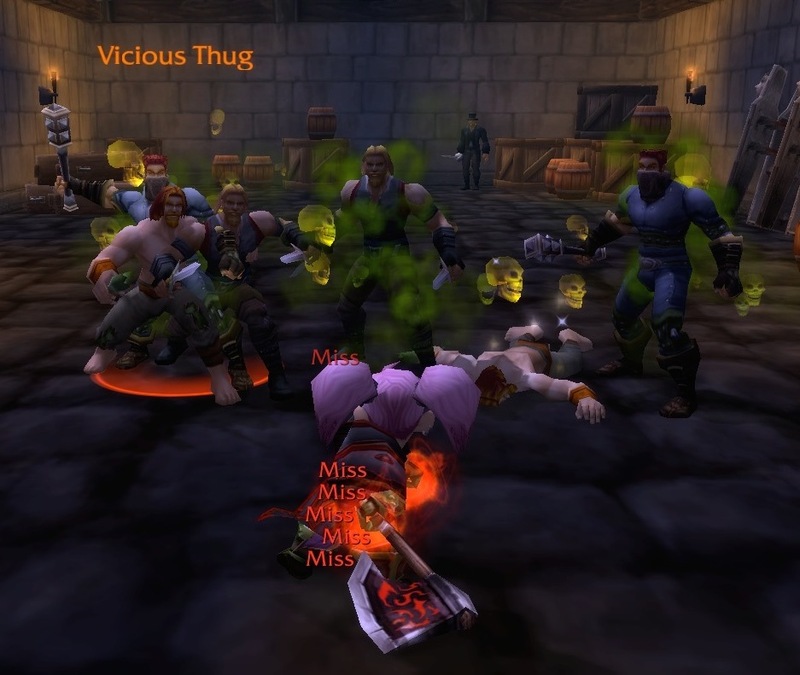 This blog shows Riglee’s quick trip through the Stormwind Stockade. 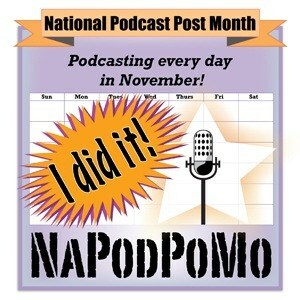 All of the screenshots in this blog were taken on May 24, 2014. 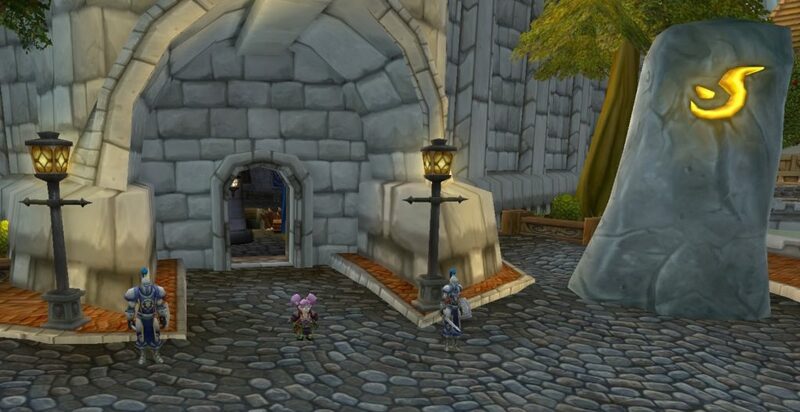 At the top of this blog, you can see Riglee hanging out in front of the entrance to the Stormwind Stockade. Two guards stand watch. This dungeon is, obviously, located inside Stormwind. It is really easy for low level Alliance characters to find it and go in. 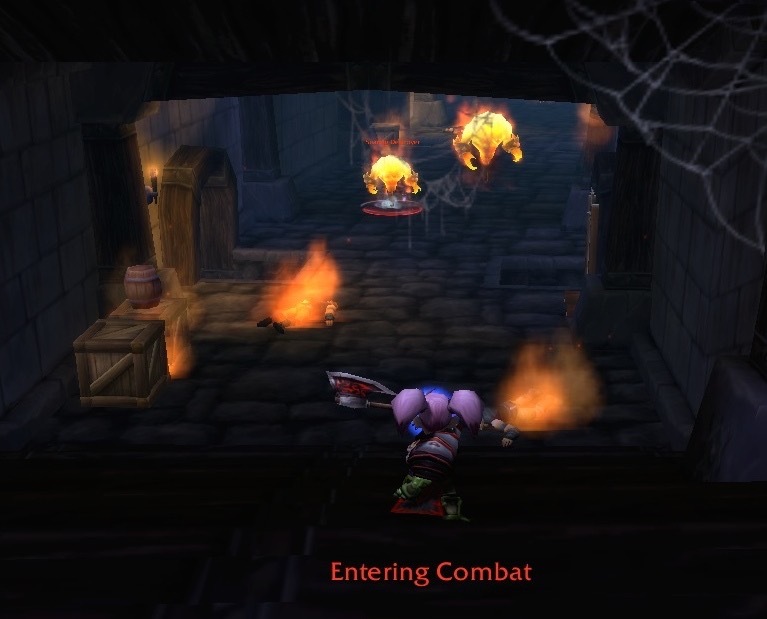 Horde characters, on the other hand, should probably wait until they are at a very high level before attempting to get into this dungeon. The NPCs (non-player characters) will try and kill you! 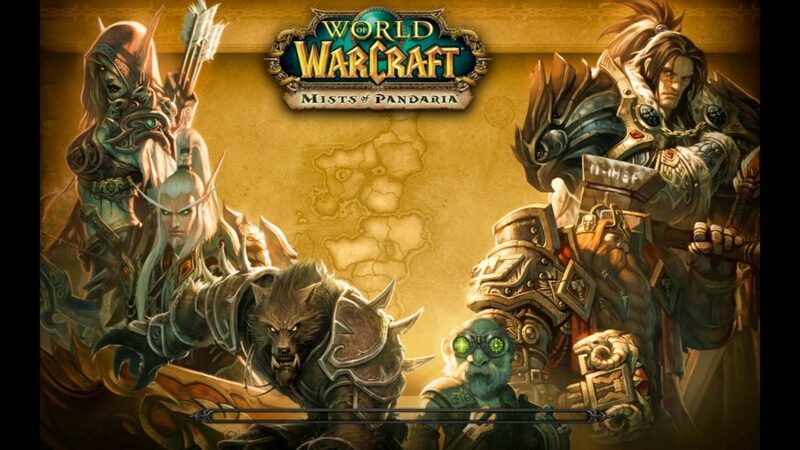 It might be entertaining for a Level 90 Horde to give it a try. Next to the entrance stands a large, glowing, meeting stone. I don’t think I’ve ever seen anyone use it. Do people still use them, or do they get on their flying mounts instead? 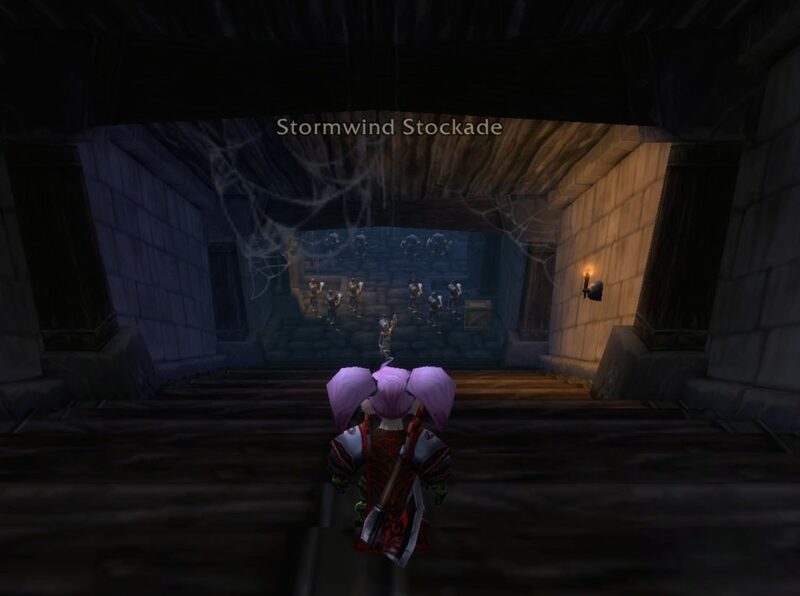 The first time I completed the Stormwind Stockcade was on October 11, 2010. Things have changed a lot since then! 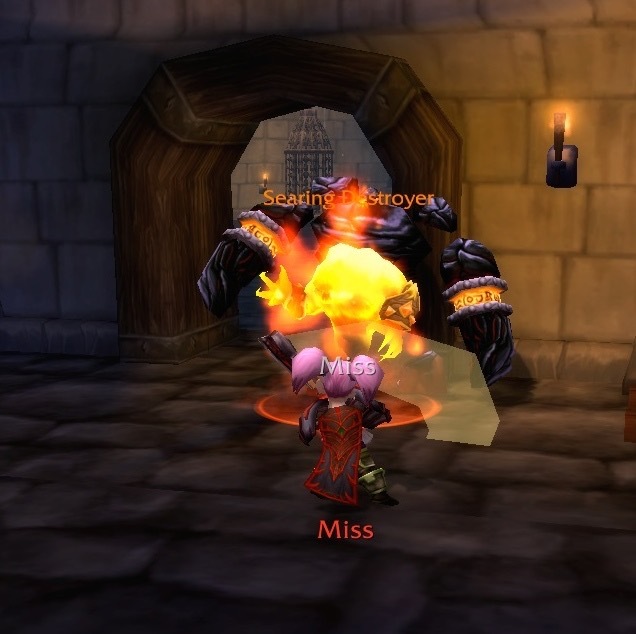 This room used to have a bunch of Stormwind Guards standing in front of the stairs. From what I remember, I think they were discussing what to do about the rebellion that had taken place in the Stockade. A bunch of the bandits they had imprisoned had broken free and taken over. The implication was that things were very dangerous down in the Stockade, and maybe you didn’t really want to get involved. Today, all those guards are gone. It’s rather empty in here. 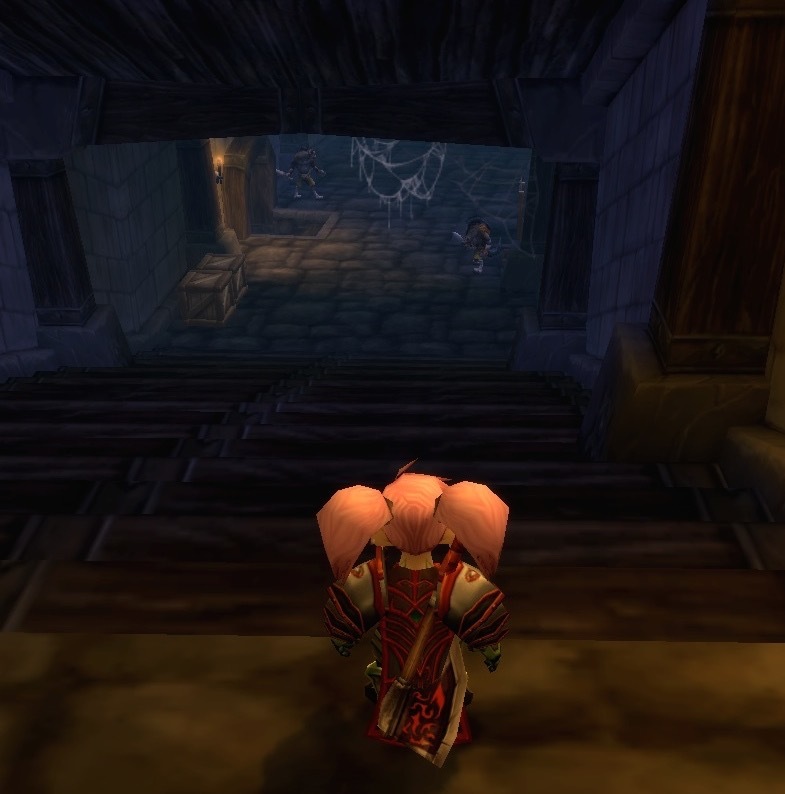 Time to run down the stairs and enter the Stormwind Stockade dungeon! 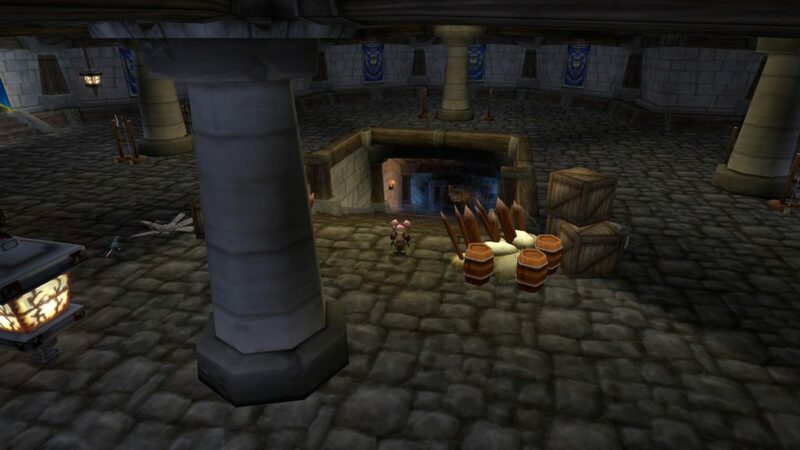 Look downstairs, and you will see where the Stormwind Guards have moved to. Seems they finally gathered the courage to go down there and do something. I’ve no idea when this change was initially made. From my perspective, it felt like the Guards had been standing at the top of the stairs, pondering their next move, for years. 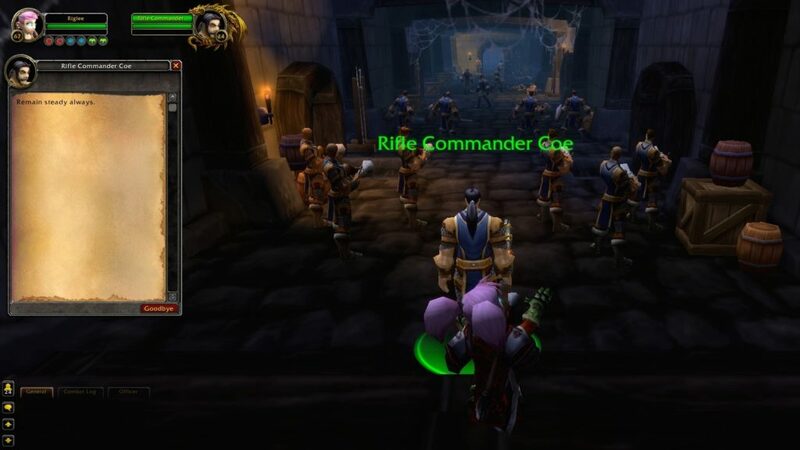 My best guess is that Rifle Commander Coe gives players the quests that they need to complete while they are in the Stormwind Stockade. However, since I’ve done this dungeon before, the quests were not popping up for me. I had no idea what the “plan” was in here. Death Knights don’t actually need a plan in order to go slaughter enemies, so that worked out just fine. Whatever their plan was, it involves big guns! In the room that is off to one side, there appears to be injured Guards who are trying to recover. In the background, Nurse Lillian /sighs. In the room that is off to one side of the main hallway, right across from this one, are more injured Guards. I think the two in the middle, who are sitting on the floor, are playing cards. Unlike the room where Nurse Lillian was working, this room has coffins, stocks, and what looks like an Iron Maiden. Mortimer Morloch is near the back of the room. He’s a Level 25 elite. I thought he was a bad guy, but his name is in green, and I can’t target him. I’m not sure what is going in in this room. Maybe the quest line (that I cannot access) gave some explanation. 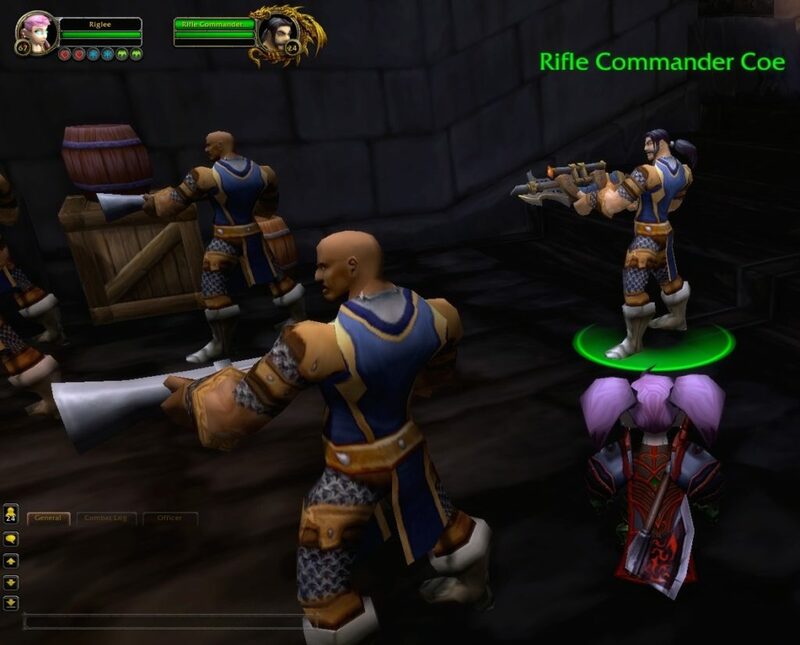 It quickly became clear that Riglee the Death Knight does not need any help from the Guards with big guns or the Guards with swords. Instead, she killed them and all the guys in the next room. 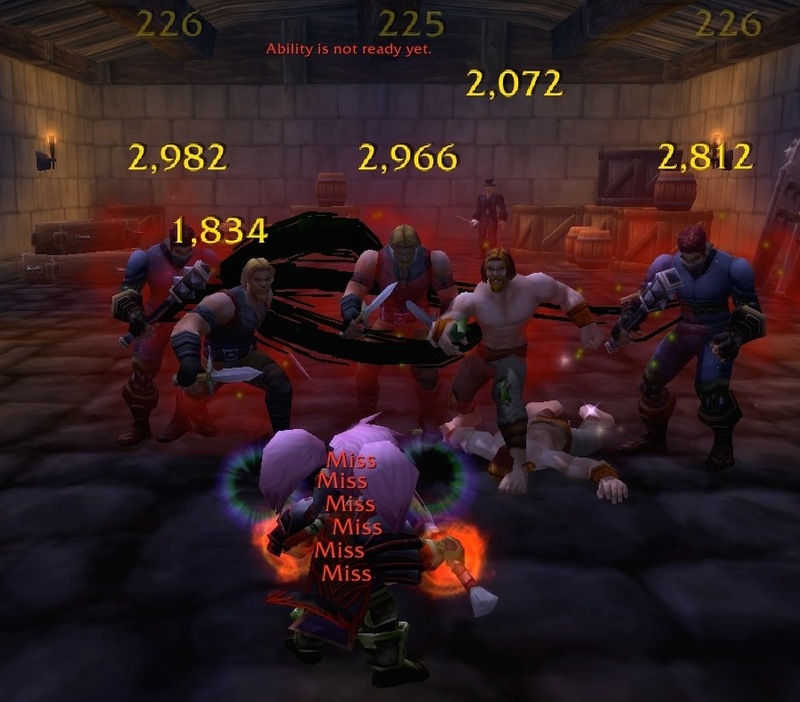 Seasoned players who want to feel incredibly overpowered can go ahead and run through the Stormwind Stockade. Otherwise, I wouldn’t recommend this particular dungeon to players who want to take a nostalgic tour of old content dungeons. The lack of access to the quest line (after you have completed it the first time) made me feel like I was missing some important “story” details. All that is left is to slay enemies (without knowing why you were supposed to kill them). Riglee is by herself, so that statement is a bit strange. Does Randolph Moloch have some kind of visual impairment that makes it difficult for him to discern how many enemies he is up against? Or, did he mean that he would be spending the rest of his day killing Riglee? 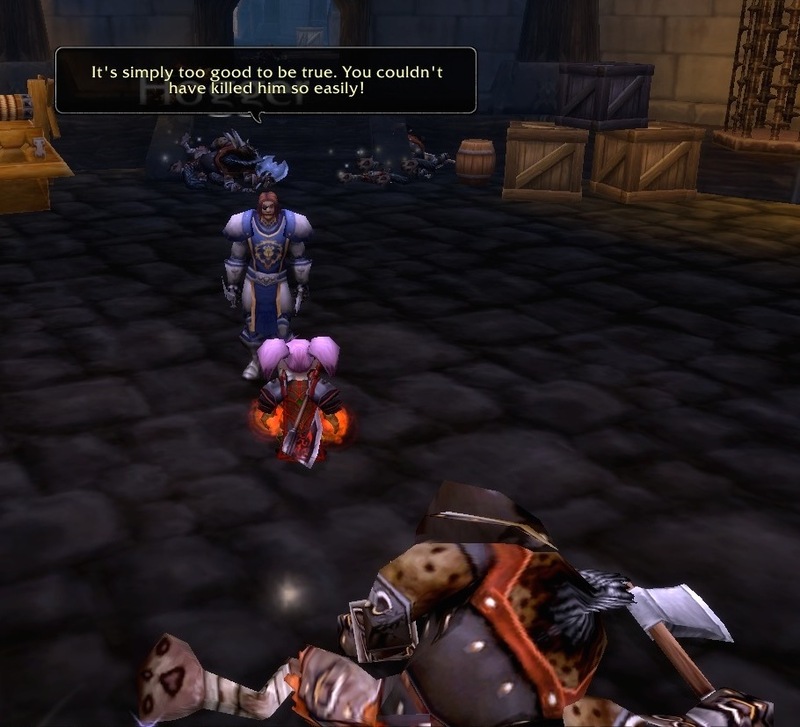 His words don’t work so well when one is soloing Stormwind Stockade. 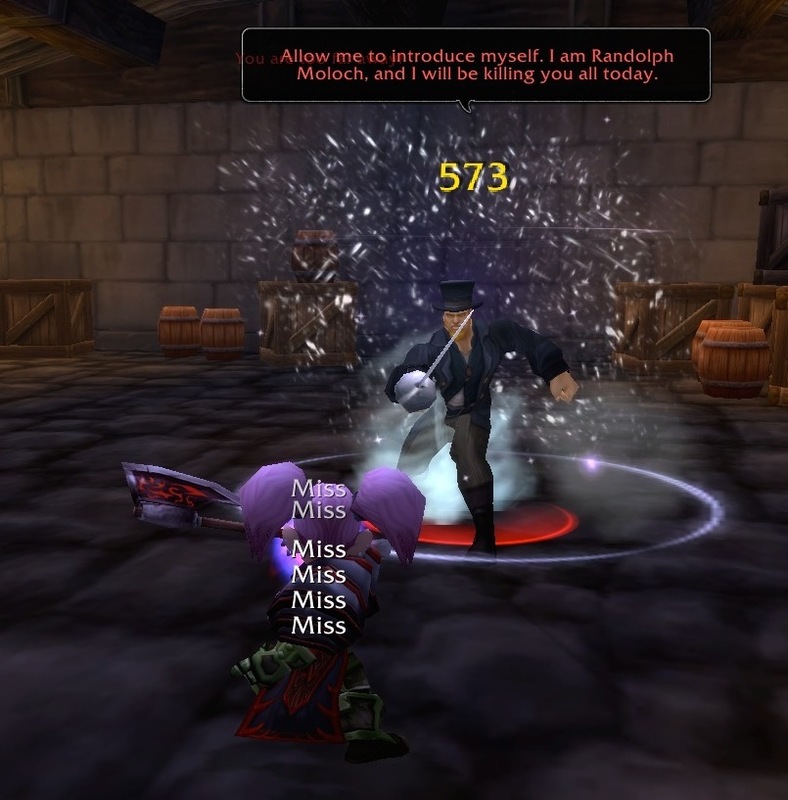 Randolph Moloch throws some sparkly stuff at you, vanishes, and reappears behind you during this fight. Randolph Moloch: My epic schemes, my great plans! Gone! That’s the end of Randolph Moloch. I’ve no idea what his schemes and plans were, but they aren’t happening now! From here, you have the option of choosing which one of two stairwells you want to go down. 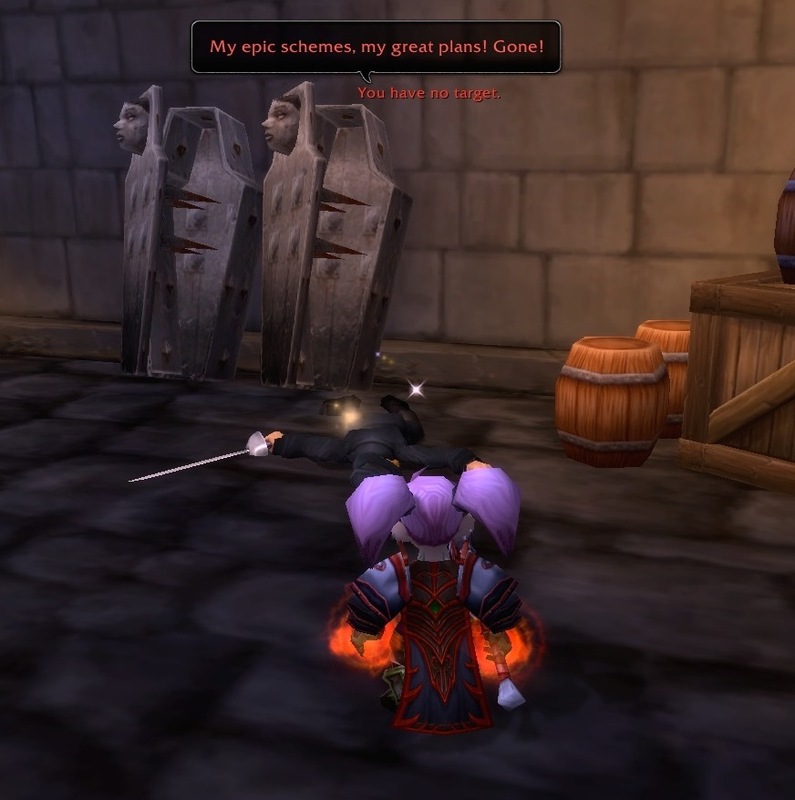 Each one contains enemies that are different from the ones you faced in the main part of the Stormwind Stockade. The variety makes this dungeon a bit more interesting than it may have otherwise been. I took a bunch of screenshots of Riglee killing Riverpaw enemies. This one was the most interesting. 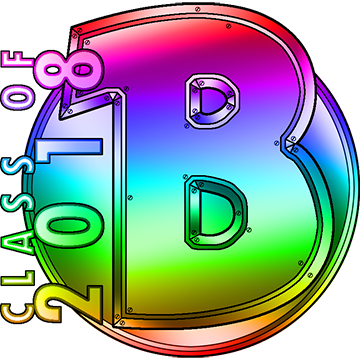 The “big bad” of this section of Stormwind Stockade is…. 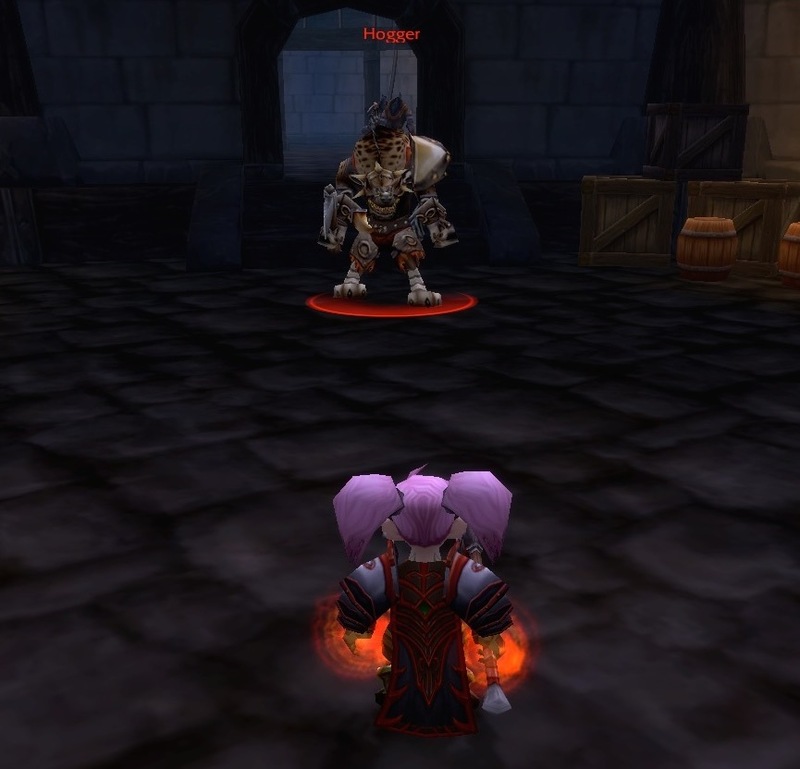 Hogger! 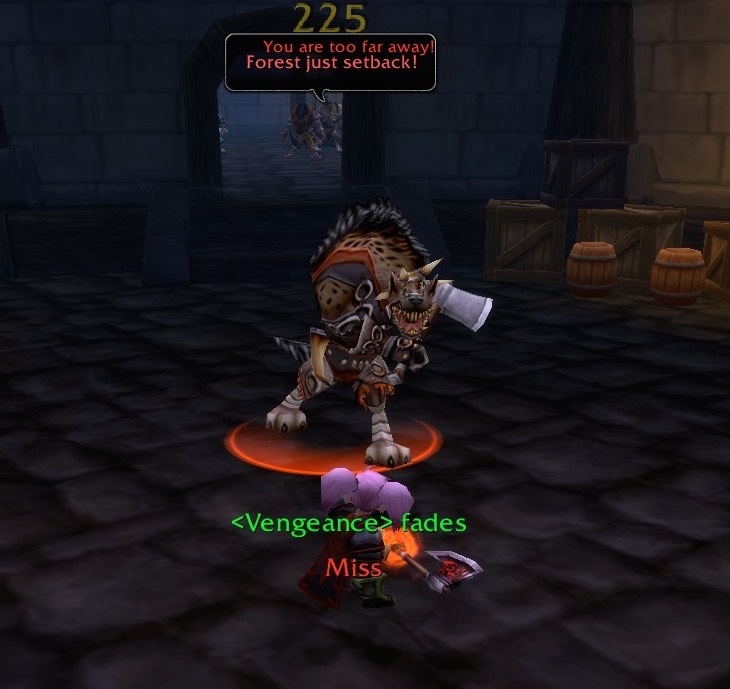 Hogger: “Forest just setback!” This makes perfect sense to those who have been playing WoW for a long, long, time. 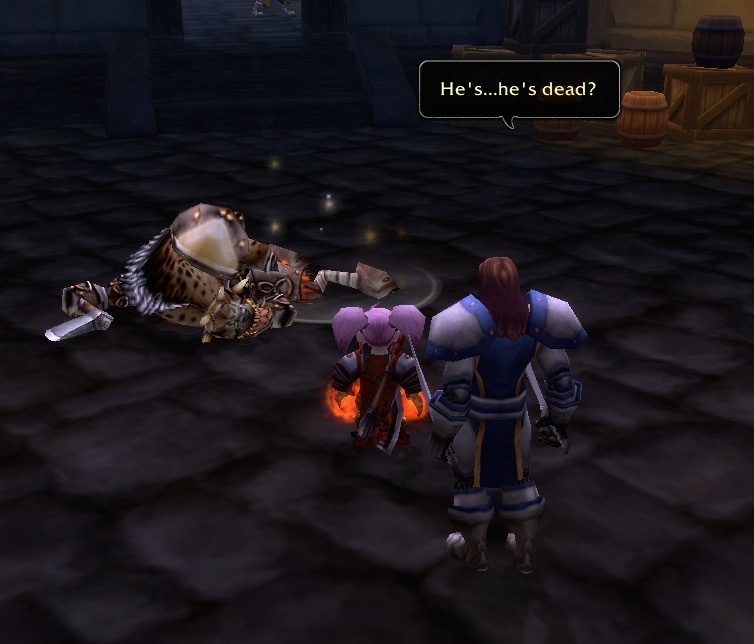 Immediately after you kill Hogger, Warden Thelwater pops up behind you and asks: “He’s… he’s dead?” I was not expecting him to suddenly appear. Warden Thelwater: It’s simply too good to be true. You couldn’t have killed him so easily! 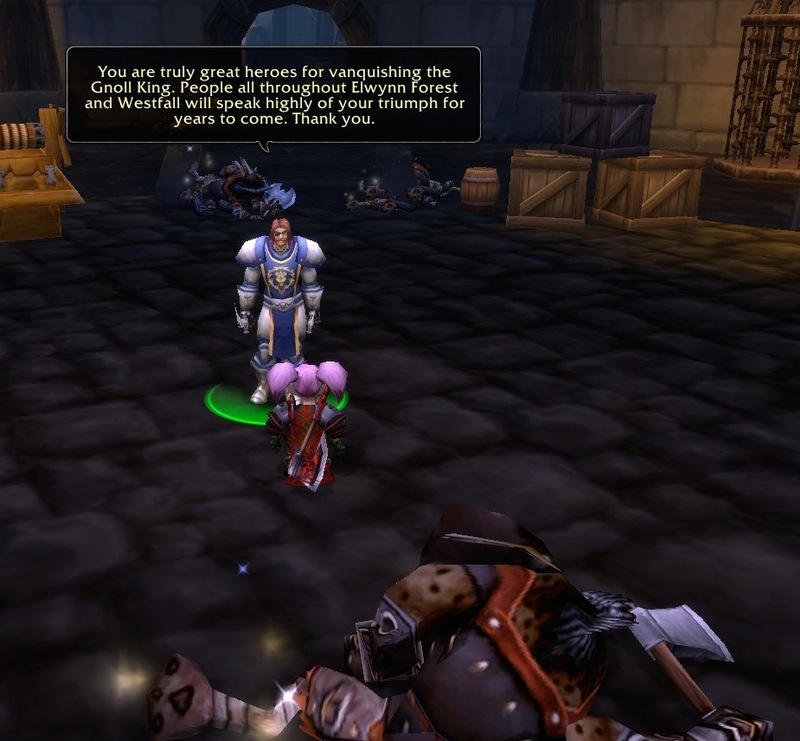 His words are a bit clunky for players who are soloing Stormwind Stockade. 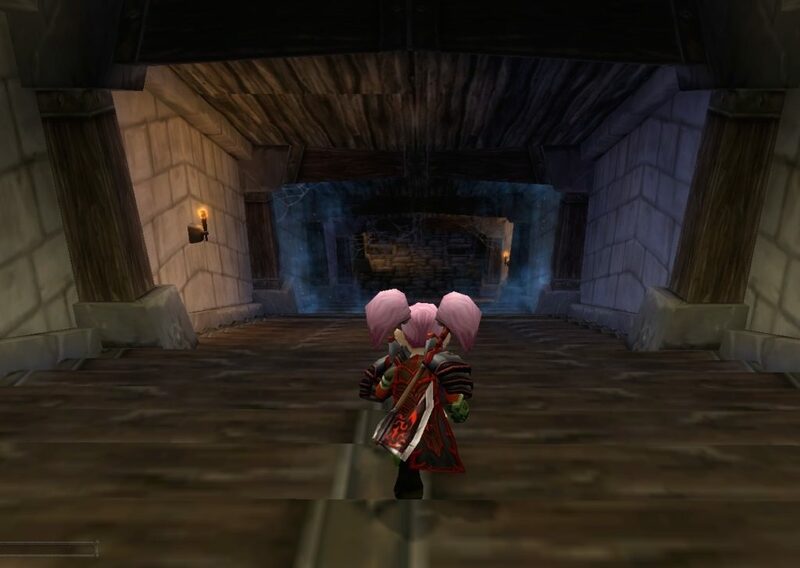 This dungeon is clearly intended to be for a group of low level Alliance characters to run through. That makes sense, given the location. 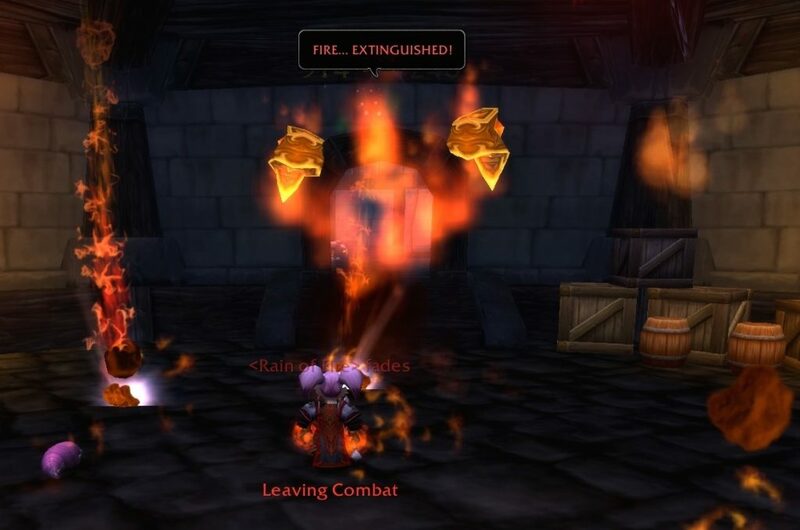 It feels like Blizzard simply did not intend players to run through this dungeon after completing it the first time. 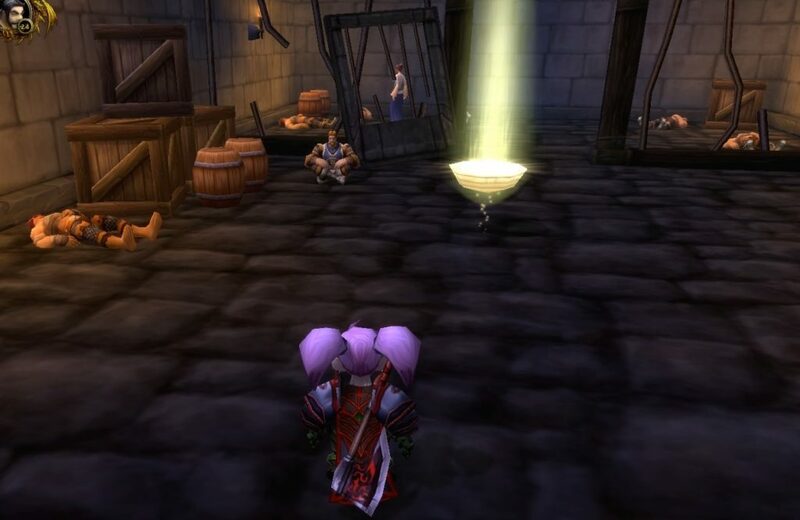 There is nothing left to do in this wing of the Stormwind Stockade. 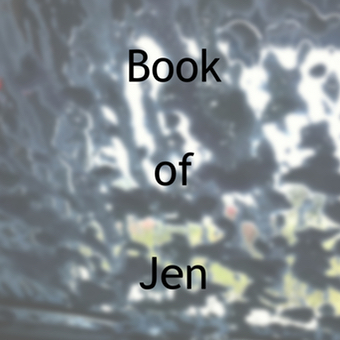 The last portion of the dungeon has…. fire elementals? Um… ok then. 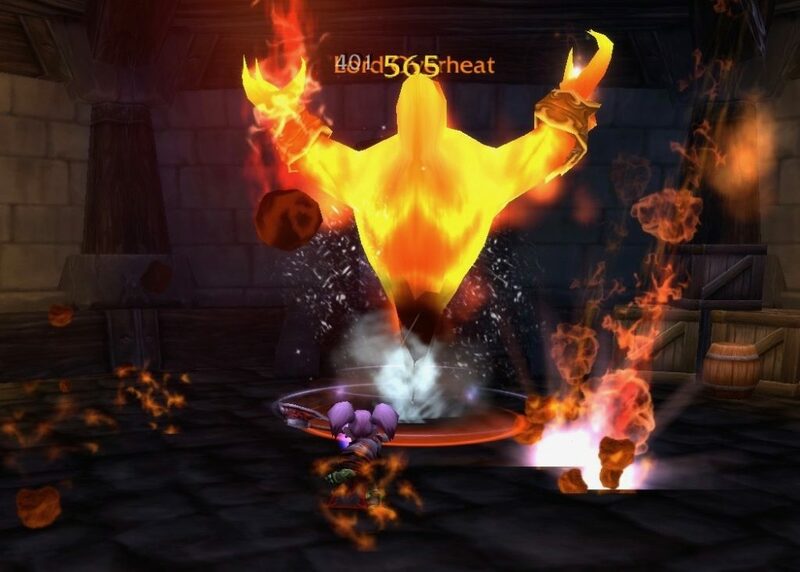 Here is the most interesting screenshot I took of Riglee fighting fire elementals and rock elementals. 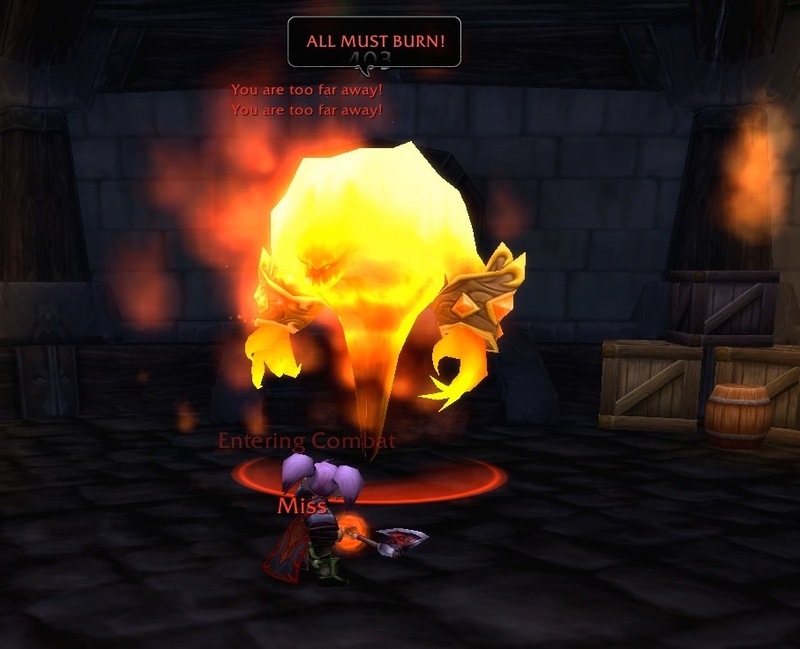 Kill Lord Overheat, and you have completed the Stormwind Stockade. There is nothing left to do in here, especially if you finish it before the enemies you killed have time to respawn. You can use your hearthstone to get back out if you want to. 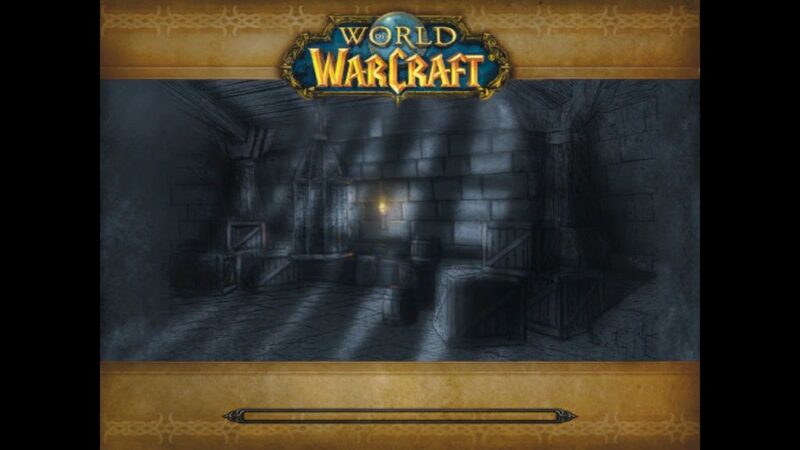 If you go back up the steps, this screen appears as you transition between the Stormwind Stockade and the rest of Stormwind. 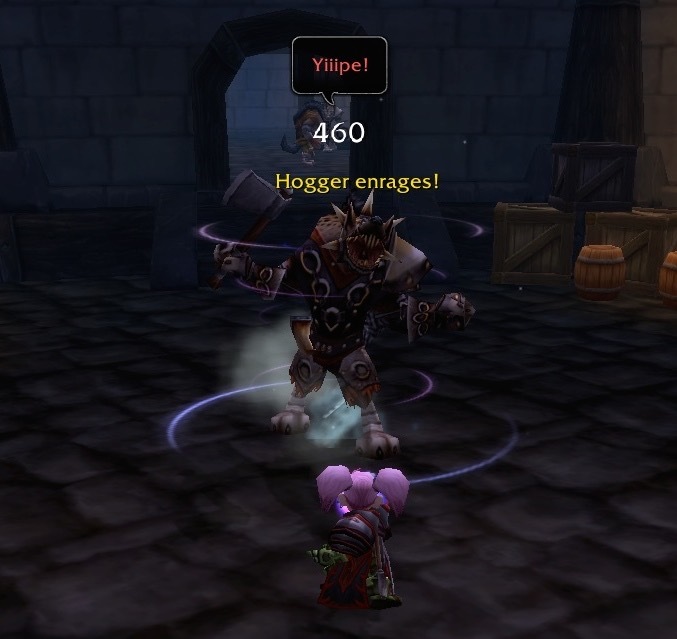 Here stands Riglee, shortly after completing the Stormwind Stockade. I cannot think of any good reasons to run her back through there. She may as well take a “selfie”.